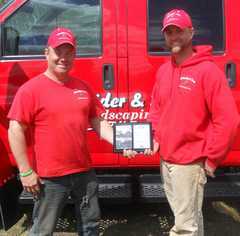 Schneider & Son's Landscaping has been a small family run business since 1996. John Schneider and Angie Schneider along with our son Johnathan, installer and long time employee Kyle Waelchli and the rest of our seasonal crew want our customers to know we are committed to remaining a small family business with attention to detail taken with each and every customer. Whether you are in need of a full landscape design, a landscape makeover, delivery of bulk product or a consultation in shoreline restoration or erosion control, we are the Company to call. For all of your paver brick, stone and masonry retaining walls, shoreline restoration, fireplaces, firepits and irrigation needs as well as softscaping with plants, lawn and lighting call us for a free estimate. We employ up to 8 full time employees during our season and we will remain focused on keeping this small family business the personal touch resource for your landscape needs. Our primary concern is that of supplying professional, quality, affordable and guaranteed landscaping for all of our customers. Our committment to you, our customer, is outlined to each and every one of our dedicated employees. The Schneider Family along with our employees join in many community based fundraisers, including The American Cancer Society and all of their related fundraisers, the Shawano Special Olympics Softball tourney and donate proudly to such childhood cancer organizations as Make a Wish Foundation, Childrens Oncology Group, National Childhood Cancer Foundation, St. Judes Childrens Hospital and Childrens Hospital of Wisconsin in honor of our son Kyle, who is a cancer survivor. We sponsor many local golf outings and youth scholarships as well as we feel very dedicated to the honor of having our business prosper so well for many years in the small area. We look forward to assisting you in any project you may be considering for the 2019 season!